(Newser) – A network of escape tunnels with entrances concealed under bathtubs helped the world's most powerful drug lord evade capture before his arrest over the weekend, investigators say. 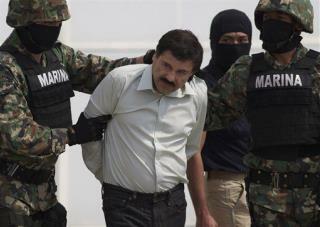 Early last week, Joaquin Guzman is believed to have escaped just minutes ahead of Mexican authorities, using a network of tunnels under the streets of Culiacan, headquarters of his Sinaloa cartel. US officials had traced Guzman to his hideout using a number on a phone seized in a raid earlier this month, the Wall Street Journal reports. dude will do the rich mans walk in two weeks at most! The arrest photo looks like some gay masquerade party prono movie.